The mollusks pictured above are either getting ready for Coachella, or showcasing an intriguing new species of sea creature. This just-discovered type of polyp spends its life decorating the shells of snails. Nassa mud snails spend their daylight lives in the sand, coming out only at night. It’s not surprising, then, that the ones just south of the Red Sea had accessories that, until now, were unknown to science. A group of biologists from the Lomonosov Moscow State University and the Russian Academy of Sciences have recently published a paper in PLOS One, about the strange polyps decorating the shells of these snails. The polyps are a form of hydrozoa, tiny invertebrates that can join together to form jellyfish-like creatures like the Portuguese Man O’ War. Not much is known about these particular hydrozoans, but they are interesting to scientists because they use green fluorescent proteins, or GFPs. These proteins, now famous in biology as tags that show gene expression, were first discovered in medusozoa—non-polyp jellyfish. It’s a rare trait in polyps. The newly-discovered species is particularly rare because they express this green glow around the “mouth” area of the polyp. The researchers speculate that the glow allows them to attract food. 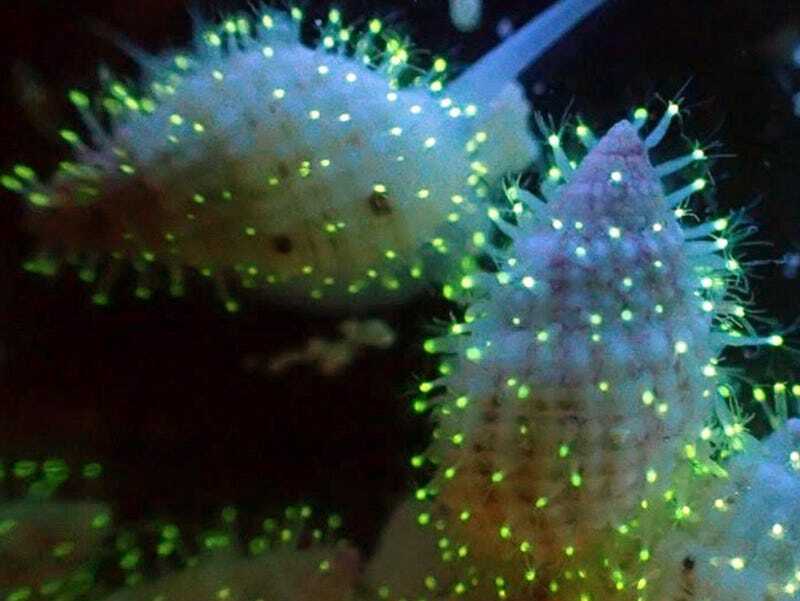 This distinguishes them from other green-glowing polyps that otherwise look very similar, giving biologists another way to tell various polyp species apart.